There is this thing that has been organised. If you've been reading stuff in the MSPA Group Project pages, you might have seen it. 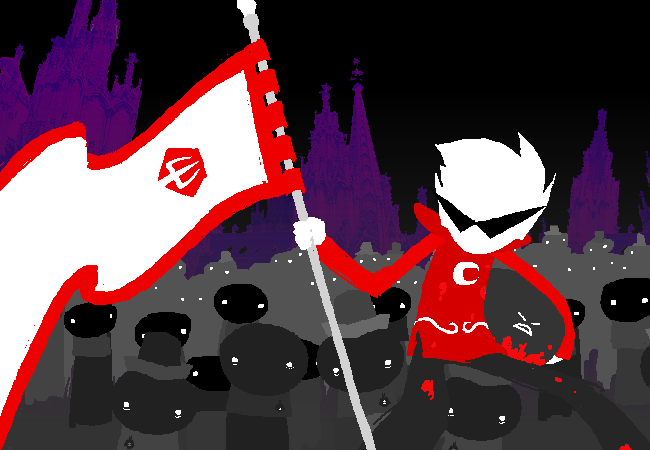 Basically, over twenty people - almost all from the forum, have started a Homestuck-themed Alliance (basically, like a gaming clan except NATIONS). This game is pretty neat, but for us to properly represent the size of our fandom, we will need more people. Lots more people. Cyber Nations is a free browser-based nation simulation game. You control things like government type, a national religion, ethnicity, tax rate, currency type, and more. Build your nation by purchasing infrastructure, technology, military forces, and so forth. It sounds hard, but is simpler than it looks. The mean investment of time required is around 5-10 minutes per day, increasing depending on how involved you want to be. We have guides and resources already to teach you how to play. We are also led by experienced people that know how the game works. All you have to do is register, listen, play and watch our armies grow into a major power! It really is that easy. This is a step-by-step guide for how to create a nation in the game. If you have and problems or questions relating to the Alliance or the game, please post them in this thread. All members that join before/on the 13th will be classified as founding members, which entitles you to being smug and possibly some other sweet stuff. We also have an opening event on the 13th that needs as many volunteers as possible! How come this is the first that I've heard of the opening event, even being on the AECN forums? (04-10-2013 07:58 AM)Kíeros Wrote: How come this is the first that I've heard of the opening event, even being on the AECN forums? I remember playing Cyber Nations a long time ago. It... was a thing. I may look into this? (04-14-2013 04:23 PM)gloomyMoron Wrote: I remember playing Cyber Nations a long time ago. It... was a thing. I may look into this? Of course. A number of us are returning players. Some of us older than others. I first played it back in 2008, for instance. There are some neat changed made since then (you can now choose trade resources), though gameplay is mostly the same.